His & Hers in Grotto Canyon, the popular Grotto Falls is just around the corner to the right. Approach: Park at Grotto Pond (signed) along Highway 1A, about 10 minutes East of Canmore. Follow the signs to Grotto Canyon in about 20 minutes. Hike up the pretty slot canyon for another 15 minutes to reach the climbs. If you continue up the left fork from here, there are some obscure climbs way back there. His (WI4): The lefthand of the two twin pillars. 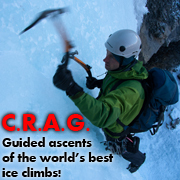 Often thin or unformed at the bottom, but some bolts in the rock help make it a more reasonable lead. Bolted station. Hers (WI3-4): The righthand of the two twin pillars. Usually in good shape. Bolted station. 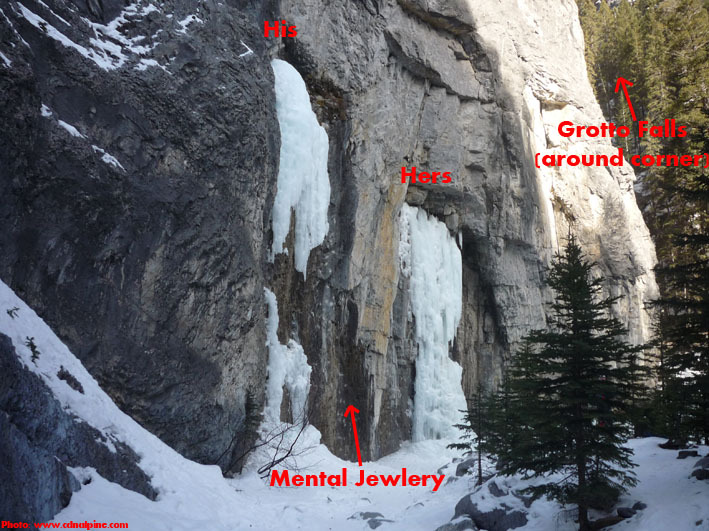 Mental Jewelry (M6+): An OK bolted mixed climb that ends by the top of His. The bolted line just to the right is a tad easier. 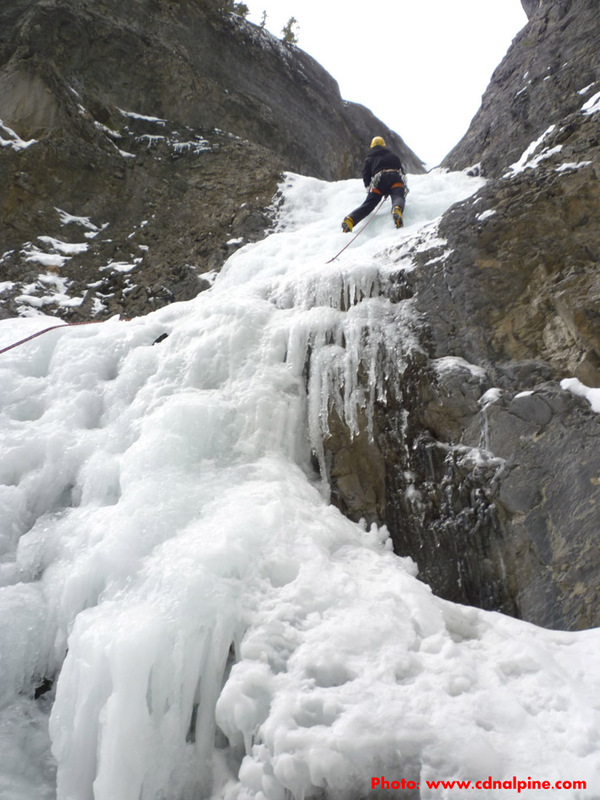 Grotto Falls (WI2): A classic 1 or 2 pitch route just to the right of the other climbs that is usually a hooked out ladder but is a fun climb. There is a chain anchor on the left at the top and another about halfway up. Descent: Rappel, mostly using bolted stations. Objective Hazards: There are occasionally reports of rock fall. No avalanche hazard. His & Hers fall down at some point each spring.